See the stunning beach city of Alanya from high above on this scenic evening tour. From the high terrace of the Alanya Mountains guests will have a twilight vantage to look down upon Cleopatra Beach and its surrounding peninsula below. 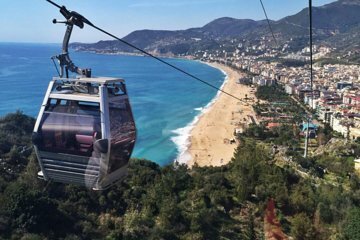 Descending again by a cable car offering unrivaled views, guests then enjoy a jeep ride to nearby medieval castle ruins before returning again to central Alanya.